Three days of high energy tournament basketball as eight teams battle for the championship trophy! On behalf of the Fathers’ Club of St. Stephen’s and St. Agnes School, welcome to the 61st Annual Sleepy Thompson Basketball Tournament. Back in 1957, the athletic director and coach, Al “Sleepy” Thompson, decided to begin a new tradition to go along with a new location and a new gymnasium, and he created the inaugural “St. Stephen’s Invitational Basketball Tournament.” That first year Christchurch School from Saluda, Virginia, Charlotte Hall from Southern Maryland and Norfolk Academy from Norfolk, Virginia, all joined the Saints for the first tournament. In 1958, the field was expanded to its present format of eight teams, with a guarantee of three full days of hard-fought, exciting basketball. The Fathers’ Club, supporter of Saints athletic programs and events on all three school campuses, is honored and proud to host this 62nd anniversary event. 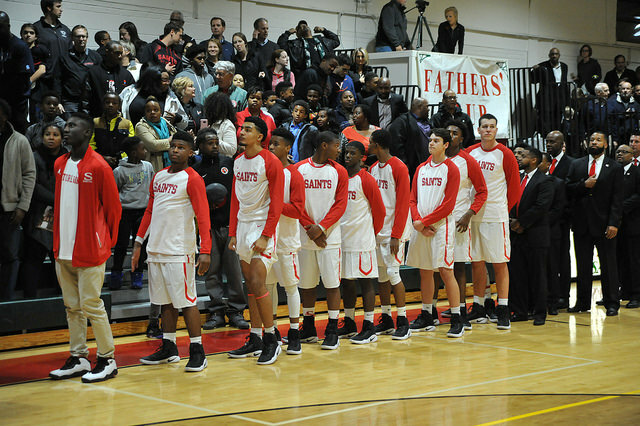 This tournament is both a high school basketball tradition and a very special event on the St. Stephen’s and St. Agnes school calendar. Lower, Middle, and Upper School students, families, faculty and staff come together for three days to show school unity and spirit, and to appreciate hard competition and sportsmanship. The atmosphere in Goodwin Gym for these games will capture the very best of high school basketball: intensity, competition, and enthusiastic school spirit. Year after year the tournament features great teams and some of the best games of the season. Enjoy these three days of high energy tournament basketball. Eight teams playing every day for the Sleepy Thompson championship trophy! Best of luck to all; have fun, and we all are looking forward to some great basketball! Three-day tournament with 8 teams and a total of 12 games. Interested in attending next year’s tournament? Contact us here. There are a number of unique sponsorship and volunteer opportunities available through the St. Stephen’s and St. Ages Fathers’ Club. Both businesses and individuals that wish to support the school can find a sponsorship or volunteer opportunity that meets their needs and provides the visibility and recognition they deserve. Make your business and services known to the St. Stephen’s and St. Agnes community and help us with placing an ad in the Sleepy program, or join one of our Platinum, Gold, Silver or Bronze sponsorship programs. If interested, please fill out the contact form below. Over the three day tournament, we have over 150 one or two hour slots that we need to fill in order to make this tournament run efficiently. We have any number of slots available from assisting in the parking lots, to selling tickets, to “crowd control” beginning at 2:30 PM Thursday and running throughout the tournament until a champion is crowned Saturday evening. If interested, please fill out the contact form below.